$120/person to ride the Davis Double (3/1 until 4/30). $55/person to ride the 100 or 45 Mile (3/1 until 4/30). $160/person to ride the Davis Double (5/1 until 5/12). $60/person to ride the 100 or 45 Mile (5/1 until 5/12). $180/person to ride the Davis Double (5/15 until 5/18). $75/person to ride the 100 or 45 Mile (5/15 until 5/18). What's included for the price of registration? 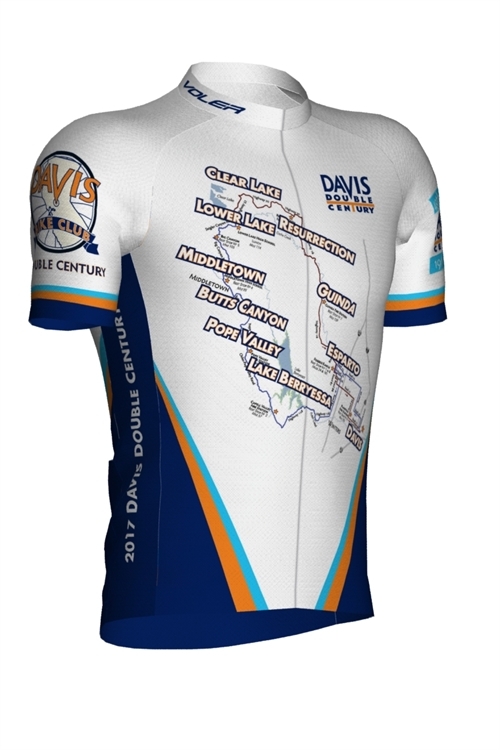 The registration price includes (1) entry to the Davis Double or shorter rides, (2) a Davis Double T-shirt, (3) a post-ride dinner Saturday night, and (4) all applicable sales tax included. Is there a Pre-Ride Dinner? The Double Century registration is limited to 1,000 riders and the shorter rides have similar limits. If a ride is not full, you may register for it during the check-in times listed above in each ride description. We can accept cash, checks, or credit cards for all registrations after May 14. When do I get my rider number? Rider numbers will be assigned after online registration closes. You do not need your rider number to check in. Yes. All rider transfers need to be arranged through the DC Registration Coordinator, and must be requested by 6:00 pm Sunday, May 12, 2019. No. This ride goes rain or shine. There are no refunds given for any reason. How do I order a jersey?